A yidam as defined by Sarah Harding, a Tibetan translator and lama in the Kagyü school of Vajrayana Buddhism. To define the concept of the yidam is to approach the essence of Tibetan Buddhism. The yidam is a special deity one works with in meditation as a means towards recognizing one’s own awakened nature. The word is said to be a contraction of yid kyi dam tshig, which essentially means to bind one’s mind (yid) by oath to a deity who embodies enlightened mind. In Tibetan Buddhism there are innumerable kinds of deities, but the yidam is defined by the very distinctive role it plays in meditation. Yidams may be sambhogkaya buddhas, tantric deities, bodhisattvas, dharma protectors or historical figures. In all cases, the yidam is the very manifestation of enlightenment, and every aspect of it is ultimately meaningful. The yidam is one of the so-called Three Roots that are the objects of refuge in vajrayana: the guru, the yidams, and the protectors and dakinis. As such, it is said to be the root of spiritual power or accomplishment (Sanskrit. siddhi). How does that work? The context for practice with a yidam in meditation is called a “means of accomplishment” (Sanskrit. sadhana). 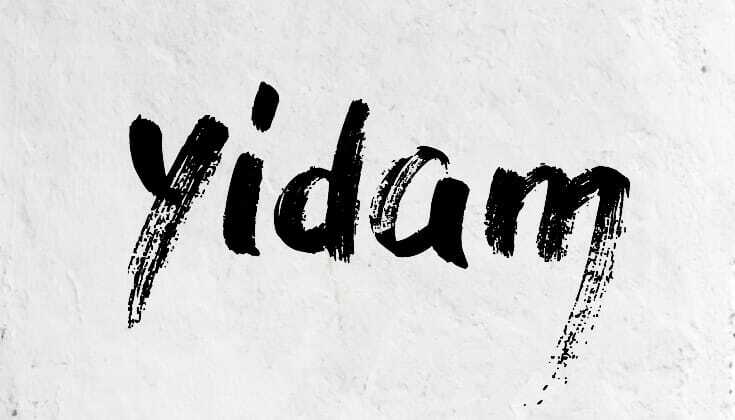 The sadhana is a liturgy that functions as a guided meditation ritual in which the process of relating to and ultimately identifying with an enlightened being (the yidam) transforms one’s ingrained, impure self-image into the embodiment of enlightenment. In Vajrayana, this ideal is always projected onto the guru, with the yidam as the medium. As a practice, it presupposes the truth of emptiness and of one’s true, or buddha, nature as radiant awareness. In visualizing the yidam deity, we use our creative imagination to shift our natural self-imaging tendency, using imagery that is ultimately more “real” than our current conditioned rendition of reality. Thus, the re-visualized self is the yidam deity and the re-imagined world is the mandala of the yidam appearing to one’s pure perception. During the process of the sadhana, one must relate with the yidam both as an object of reverence and a source of blessing. It is also an embodiment of one’s own intrinsic pure awareness. The resolution of the seemingly contradictory status of being both externally real and intrinsically inseparable from awareness is the very stuff of enlightenment in the vajra vehicle. So how does one get one of these yidams? Using one possible connotation of “dam” in yidam as choice, Gangteng Tulku described one’s yidam not as a conscious choice but rather a “choice of the heart,” a feeling of relationship. 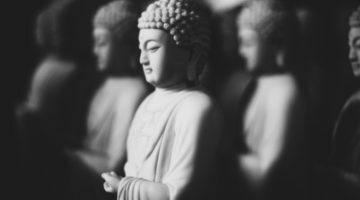 Chögyam Trungpa Rinpoche called this a “choiceless choice.” Particular deities somehow manifest the individual’s potential enlightenment, and this might be discovered through practice. Sometimes the disciple takes on the special yidams of their teacher and the lineage. During empowerment, one throws a flower into a mandala to reveal one’s buddha family connection. If one really can’t make this choiceless choice by oneself, there is also the custom of requesting an all-knowing guru to give you a yidam to work with, as many people did with the 16th Karmapa, the head of the Kagyü lineage. Really, any deity that one is practicing at any particular time may be considered a yidam. It would certainly be counter-productive to get attached to one yidam and wear it as a trophy or possess it as a bigger, better Self. It is to avoid that kind of misguided spiritual pride that one’s yidam is usually not flaunted in public. It is also believed that its power would thereby be diminished. At the same time, that very secrecy is quite enticing. 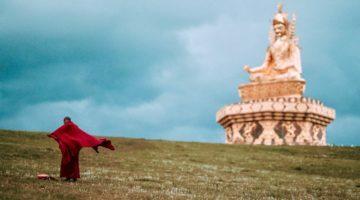 I had always wondered about the secret yidam of Kalu Rinpoche, the teacher who guided me through the traditional three-year retreat. I imagined his yidam must be very exotic, with many arms and legs, perhaps a winged heruka (male deity) or a wrathful feminine deity. About a year into the retreat he came to visit us, going from cell to cell, sitting in the boxes we spent most of our time in, inviting questions. I thought surely this would be the time that he would share his intimate practice. I remember his exact response to my question, and I am sure he was telling the truth. He said, “Who me? I do mani.” His practice was nothing more elaborate than the recitation of Om mani padme hung, the mantra of Avlokitesvara, the most common of all Tibetan practices. Sarah Harding is a Tibetan translator and lama in the Kagyü school of Vajrayana Buddhism. 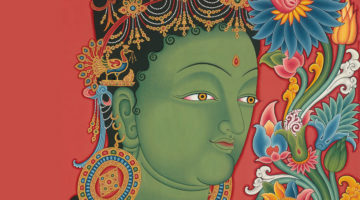 She translated Jamgon Kongtrul's Creation and Completion (Wisdom Publications).